Our Energy System contains many energy centres called Chakras and pathways called Meridians. However, there are 7 main Chakras that we work with. Anyone can learn about these Chakras and begin to work with them. Because these Chakras are always 'in motion' it is important to your over all health and well being that you learn how to care for them. An Energy Therapist can clear and balance the centres for you but ultimately they should also be teaching you how to do it yourself. Chakras are constantly receiving stimuli. Depending on how aware we are depends on how our Chakras take on the stimuli which also depends on what is happening in our lives, the experiences we have and how we choose to experience our experiences. This can work vice versa as well. So as you clear and balance your Chakras you will begin to respond to life in a different, clearer and more healthy way. 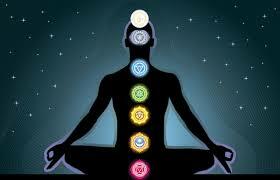 The more you work with your Chakras the clearer you will stay for longer periods of time. The more you become aware of your Chakras the more you will notice when you have accepted an energy that is not working for you. At that time you can consciously decide to change the affect and clear the energy or see your Energy Therapist for a clearing. During a session with me: You will lay on a massage table fully clothed. It is wise to remove jewelry, watches and belts as they can divert or block the energy flow. I may use a pendulum to check the energy flow of the Chakras or place my hands slightly above the body to experience the energy. Feedback as to how they are flowing and what may be happening in your life or how your experiencing the events. is then offered. From there the session will proceed with you closing your eyes and just relaxing... sometimes falling a sleep. I will then support your body in clearing and balancing your energy by being a conduit for Universal/Reiki/Angelic or White Light energy. If you feel comfortable with dialogue then there may be some conversation about what is happening and how to change or let go of the energy. You may experience lightness, heaviness, tingles, muscle spasm or twitching, heat, cold, sleepiness or a need to go to the washroom or nothing at all. Every person is different in their experiences. At the end of the session you may feel like you just woke up from a good long nights rest (even if you didn't even close your eyes) or you may feel tired and desire a short nap. Most do experience a slight change in how they feel and leave with a lightness in their step. Be sure you feel grounded - connected to earth - and if you are still feeling light headed when you leave that you take a moment before driving.